First up in the walk is a stop at our bottling room, where you will enjoy a lovely “Bee’s Knees” cocktail, made with Barr Hill Gin, lemon, and honey. Sip and enjoy while learning about the bottling process, our distribution reach, and get a chance to dip bottles in fragrant beeswax. We seal our bottle tops with beeswax as a way to honor the honeybee and to showcase our natural roots. Next on the walk is Ryan Christiansen, President and Head Distiller at Caledonia Spirits. Sip on a local favorite, “Hardwick Hooch,” made with Barr Hill Vodka, Switchel, and Sumptuous Syrups Yellow Ginger. He will lead the tour and dive into all aspects of distilling. 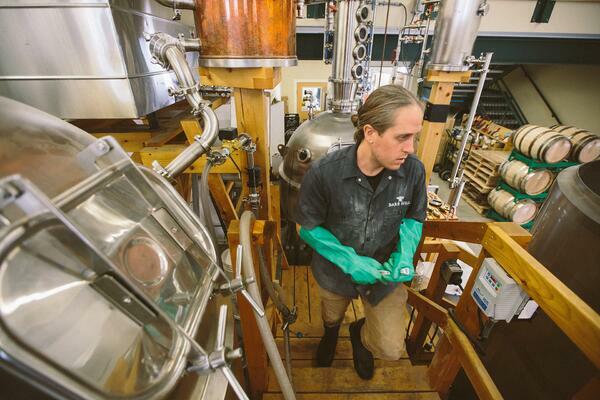 Ryan will walk you through the fermentation of raw honey, the key ingredient in every Barr Hill spirit, and what it means to make Landcrafted spirits in the heart of Vermont. The walk ends in the barrel room where a discussion of our barrel aging process takes place, while enjoying, “The Woodland Hive” a robust cocktail that features Tom Cat Gin, Orleans Wood, and Runamok Maple Syrup. Throughout the walk you will stop three times to enjoy signature Barr Hill cocktails. 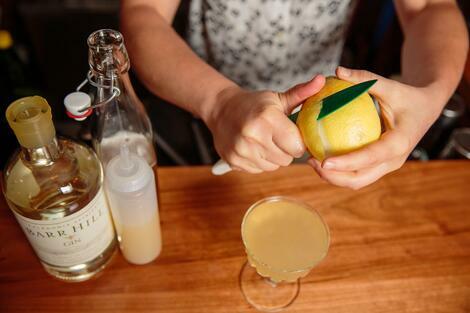 Our very own Sophia Barsalow and Hallie Picard will be mixing up the cocktails with our honey-inspired spirits. 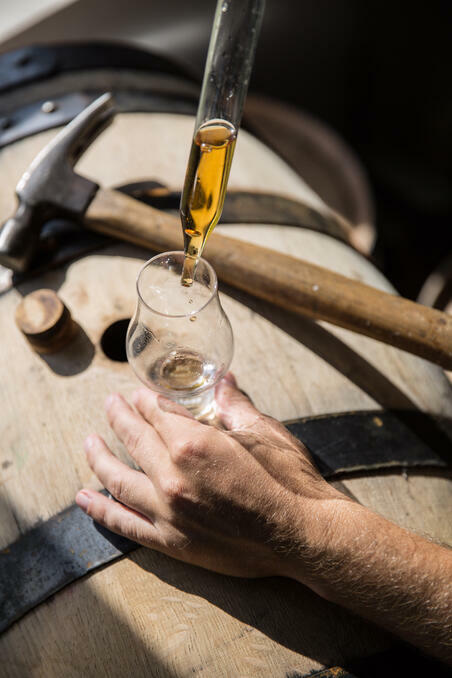 While you see the distilling process in action and smell the beeswax sealing off each Barr Hill bottle, you’ll also get to taste the award-winning flavors of our mindfully distilled spirits. You will also get to meet Adam Krakowski, a Vermont author and historian who will be doing a book signing and leading a lively discussion on prohibition. Adam’s book, Vermont Prohibition: Teetotalers, Bootleggers & Corruption, covers Vermont’s prohibition history and the state’s relationship with spirits, cider, and beer. For the Distillery walk, he is going to discuss “how the role of Prohibition damaged the economics of many towns in Vermont creating a self-induced crisis. Vermont suffered what was essentially an 80 year stretch in Prohibition between state and federal mandate. While the implications were far reaching, it took nearly 150 years for a distillery to reopen in Vermont, reconstructing the industry from the ground up. The lack of any real distillation history in Vermont also created a situation where distillers and distilleries in Vermont are not confined to any heritage. I will also discuss what early Vermont distilleries were doing as well as what is occurring now in the industry. Finally, I will also discuss the evolution of cocktail recipes from early Vermont history to the present.” Adam’s discussion will give participants a new perspective on Vermont distilleries and spirits, providing an educational and entertaining element to the event. To top it all off we’ll have a plate of Jasper Hill cheese, which is not only delicious, but is also made in the Northeast Kingdom of Vermont. According to Jasper Hill, “Jasper Hill's mission is to make the highest possible quality products in a way that supports Vermont's working landscape.” Now that’s a work philosophy we can really raise our glass to! Join us on September 21st at 3 PM for a specialized tour filled with delicious drinks and great company. We hope to see you there!